Can Too Much Sleep Kill Me? Home > California Health Insurance News > California Association of Realtors > Can Too Much Sleep Kill Me? 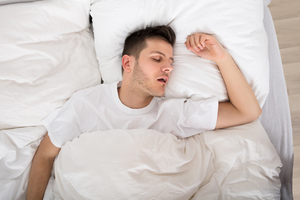 Most experts recommend adults sleep at least 6 to eight hours a night. Getting plenty of sleep helps promote a healthy body and a fully functioning brain the next day. But this doesn’t mean the more you sleep, the better. In fact, sleeping too much can actually be detrimental to your health. A new study revealed adults who sleep more than they should may be more at risk for heart disease and even death. Individuals sleeping between six and eight hours a night experienced a 7.8 per 1,000 rate of heart disease and death. Individuals sleeping between eight and nine hours a night experienced an 8.4 per 1,000 rate of heart disease and death. Individuals sleeping between nine and 10 hours a night experienced a 10.4 per 1,000 rate of heart disease and death. Individuals sleeping over 10 hours a night experienced a 14.8 per 1,000 rate of heart disease and death. The risk of heart disease and death jumps five percent, 17 percent, and 41 percent for every hour you sleep per night over the recommended amount. The rate of heart disease and death also increased for people who slept less than the recommended amount: individuals who sleep less than six hours a night have an average rate of heart disease and death of 9.4 per 1,000. One thing worth noting is that sleeping too much doesn’t directly cause heart disease and death. Sleeping too much is a symptom of an underlying problem that increases the rate of heart disease and death. Poor health often causes people to sleep more than they should because the body is attempting to recover. For more information and advice concerning how sleep affects your health, by visiting us at The Benefits Store today.